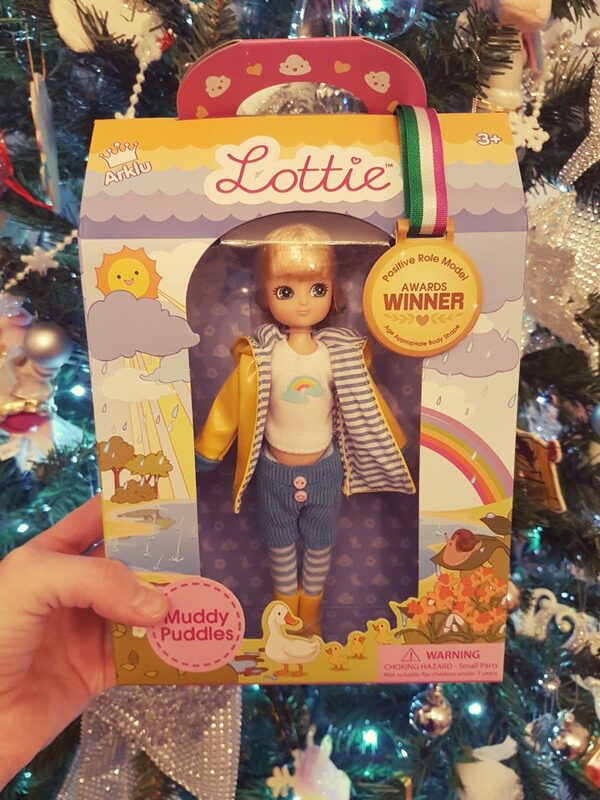 We were kindly sent a Muddy Puddles Lottie doll to review for Emily, she chose this dolly because jumping in muddy puddles is what Emily loves to do the most. 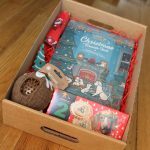 When Lottie was delivered and I had taken her box out of the packaging, I was drawn instantly by the illustrations. On the front, as you can see there is a rainbow one side, and on the other side, there is a black rain cloud with the suns face appearing just above it with gleaming rays. You can also see the little ducks at the bottom and some beautiful flowers. 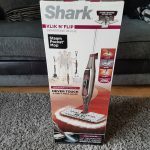 On the back of the box, There is a cloud picture which allows you to write whoever you are buying/gifting her too and a short paragraph telling you about how much she loves being outdoors and muddle puddles. 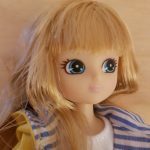 Lottie stands 18cm tall and is dressed in age-appropriate clothes. 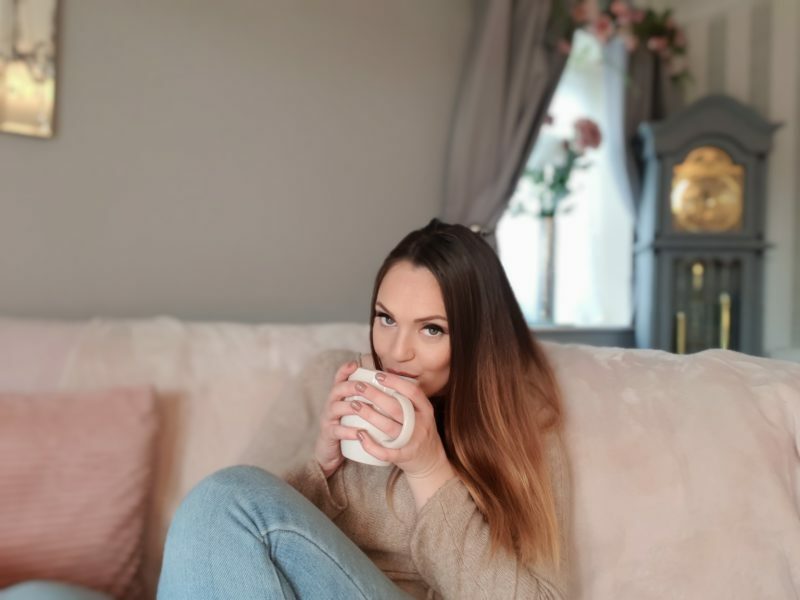 The quality of her clothing is lovely, you can tell straight away that this little lady has been made with a lot of love and care, the quality of her clothes, face and hair is perfect, she doesn’t look cheap or nasty in any way. 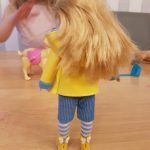 Lottie has long blonde hair and is wearing blue and white striped Leggins, she has knee-length corded shorts with 2 pink buttons she wears over the top of leggings. 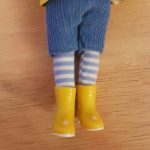 She is wearing yellow polka dot wellie-boots with cute little bows on the back and a white t-shirt with a rainbow picture on the front with a yellow hooded rain jacket on. Lottie is an Award winner for positive role model with her age appropriate body shape. She also has no makeup on or wears high heel shoes. 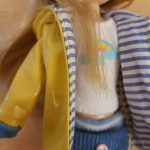 Emily has really enjoyed playing with this doll and what makes it even better is that she has a child’s body frame, she wears NO makeup and is dressed in children’s clothes. Muddy puddle Lottie and Emily wear the same style of clothes which makes Milly love her even more, She has already asked for another one.